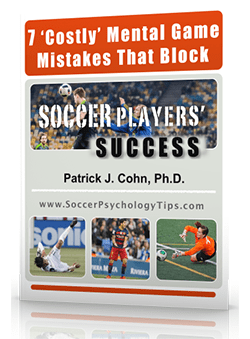 You are here: Home / Soccer Psychology Tips and Strategies / VIDEO: How To Perform With Ultimate Confidence in Soccer! VIDEO: How To Perform With Ultimate Confidence in Soccer! Confidence in soccer is imperative for players to perform their best! 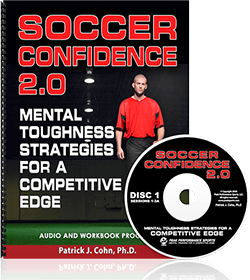 We are very excited to announce our new CD and Workbook Program, “Soccer Confidence: Mental Toughness Strategies For A Competitive Edge” in the video below. In the video, we talk about two types of confidence, proactive confidence and reactive confidence. This is just one of the mental strategies we teach in our new CD and Workbook program. 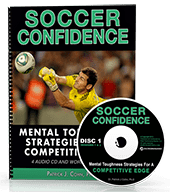 Soccer Confidence is a soccer specific mental training workbook and CD program designed to teach soccer players how to perform with confidence, composure, and focus in training and competition. This program is also great for coaches and parents who want to learn how help their players be mentally tough on and off the field. The program includes a workbook and 4 CD’s that will give players the tools they need to take their game to the next level. In addition, the program comes with 5 free bonus programs. If you are ready to improve your mental toughness and perform with ultimate self-confidence in games, we have a program that will do just that. 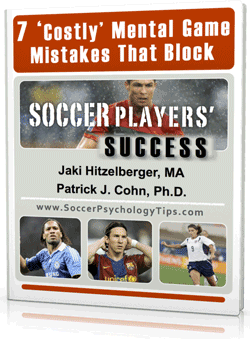 Your soccer mental game experts Jaki Hitzelberger, MA, MGCP and Dr. Patrick Cohn want to share with you powerful mental strategies to help you (or your team) perform your best in practice and games. You get eight pregame audios to review the most important mental strategies for each of the eight mental game sessions. Repetition is also key to learning the mental game. An entire bonus session on how to get the most out of your training. Learn how to get maximum benefit from your practices. You’ll learn how to best improve your skills and mental game. Includes an assessment that will help you identify what prevents you from playing aggressive. Also includes a worksheet to help you improve you intensity in practice and games. Parents, learn what to say before and after games to support your athlete’s confidence, focus, and composure. Coaches, this checklist gives you great tips on how to ensure your players are mentally prepared for competition!